Pokela is a simple and easy to approach tableware range made entirely out of recycle clay. The project was commissioned by Mr Hasegawa at the Green Life 21 project which is a nationwide clay recycle project aiming to produce environmentally sound products out of used and broken ceramics. The Pokela range was awarded a national Good Design award in Japan in 2004. 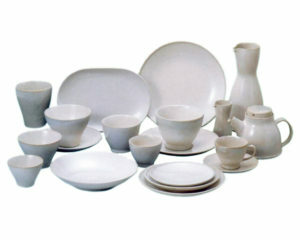 The range is produced by Ichihara seto Co. and can be bought in many outlets around Japan. It is also used in the Brown rice café that provides a healthy vegetarian menu based on organic micro biotic research.